The fifth annual New Canaan All Out for Autism 5k Walk/Run Road Race, scheduled for 6 p.m. on Friday, Aug. 23, will raise funds for special-needs programs at the New Canaan YMCA. Sponsors of the race include New Balance of New Canaan, SPED*NET New Canaan, the New Canaan YMCA, Karl Chevrolet, Joe's Pizzeria, Rosie, Walter Stewart's Market, Oxygen Fitness, C&H Automotive, Aetheria Relaxation Spa, SLC Therapy, Healthfare, Brueggers, Milestones and the New Canaan Police Benevolent Association. "Karl Chevrolet joins New Balance and other community-minded businesses in underwriting the All Out for Autism race again this year because events like these highlight health, family fitness and community," said Steve Karl, vice president of the dealership. "We've been involved since the beginning in helping to raise funds, first for the now-completed fitness area, which has added so much to the quality of life for many families in town, and subsequently for these new programs at the Y. We also love the way these races bring people to the downtown area, which is great for New Canaan -- and since New Canaan celebrates its third annual Restaurant Week beginning on the 23rd, we encourage families to come for the race and then stay and try one of our great restaurants in town," he added. Sara Koch, co-owner of Oxygen Fitness with her husband, Dave, said, "We have a lot of friends who are impacted by autism in some way, and we think this is a great way to raise money and awareness." Oxygen Fitness, which opened in New Canaan in May, is sponsoring the race with a $5,000 contribution. "The race also coincides perfectly with our message of fitness, staying healthy and doing activities with your family. Oxygen Fitness is a full-service, boutique fitness facility offering yoga, barre, cycling, boxing and boot camp group classes, cardio and weight equipment and a juice bar," she said. 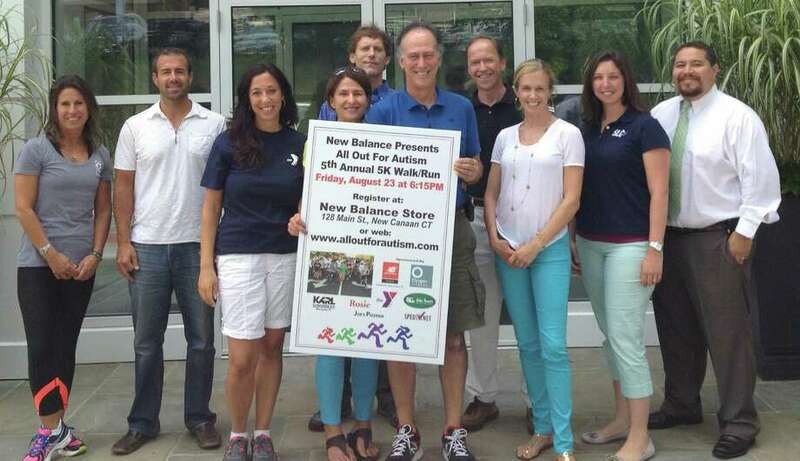 Ron Rosenfeld, owner of the New Balance store on Main Street where the course begins and ends, added, "Previous races helped us construct the new fitness area at Waveny that is used by New Canaan's senior citizens and high school students, as well as those with special needs, and then last year our race helped fund special events for children with special needs at the local YMCA. The events at the ' were open to the whole community and offered a terrific opportunity for people to get to know each other, so we've decided to support that again this year." The 5k race begins at 6:30 p.m. and winds through downtown New Canaan and neighboring streets. New Balance shoes will be awarded to the top three overall 5k winners, both male and female, and New Balance gift certificates will be presented to the top three in each age category, male and female. A separate, quarter-mile children's fun run kicks off at 6:15 p.m. Registration is available at New Balance or online at www.AllOutforAutism.org. The fee is $25 through Aug. 22. Race-day registration is $30. The registration fee for New Canaan High School students is $15. Runners should check in before the race at the New Balance store. Pre-registered racers will receive a complimentary T-shirt, and refreshments will be served following the race. The race was first conceived when Rosenfeld and his wife, Tina, had observed parents coming into the store to buy shoes for their child, unaccompanied by the child, then coming back months later to buy new shoes, still without their child. The parents remarked that their child had autism, so the Rosenfelds decided to open the store after hours to accommodate the families and began asking how else they could help. They joined forces with SPED*NET, a nonprofit that serves families with special-needs children, and began to help raise funds to install a multi-generational, sensory-friendly community fitness area at Waveny that would help relieve the isolation many families felt. The fitness center opened in 2011 and has proven to be a great addition to the New Canaan community, Rosenfeld noted. "There are currently about 400 students in the New Canaan public schools with an IEP (Individual Education Plan), and nationally 1 in every 88 children born today is diagnosed with autism," said Judi Anders, president of SPED*NET and a mother of a child with autism. "It's the fastest-growing serious developmental disability in the U.S."